Ever since the original DamonCarltonandaPolarBear.com campaign, and especially after the fake poster on the right appeared, fans have been asking for a poster based around this seminal moment in the show's history. So this poster from The Little Friends of Printmaking is a clever way of giving us two aspects to this scene. The original scene is flashed back to in the scene from season six which starts Desmond's awakening to the reality of the sideways life. The images in this post were kindly sent in by JPL and MEL. To add even more interest to this image the words on Charlies hand glow in the dark. 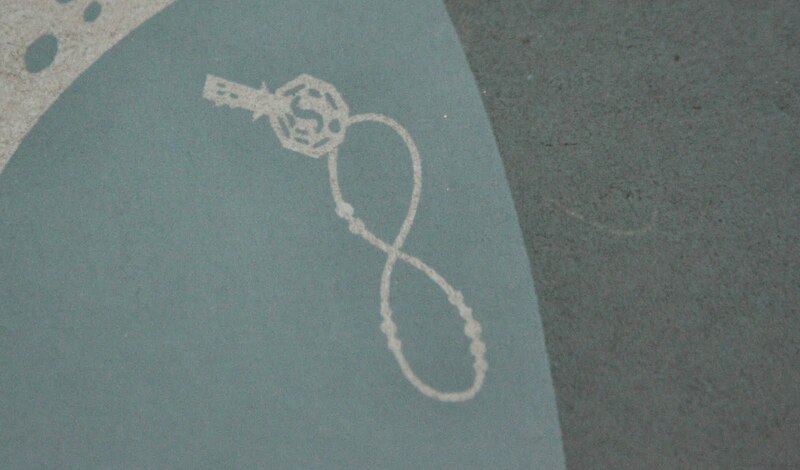 There are also a few surprises in the print not visible from the small preview we saw on the DCaaPB website. This is the most obvious one, that JPL, told us about, but I am told there are others. The two signatures pictures below highlight that cameras can be very misleading when it comes to colours as they look completely different. But I am assured that the darker blue of the two is the more accurate for this part of the poster. Not sure if Blogger comments are working yet, but here goes. the poster is alot neater than it looked on DCAAPB I love the colors and the design. I should have bought it with Chaarlie being my fav person on the show.. I miss chatting with my friends here every week, hope your all well. Were melting here in the heat. I didn't like the style of this one, though I can appreciate the fact that others would. Desmond was one of my favorite characters, and while I was disappointed by the two posters that portrayed him in this series, I was happy that he was in them. well, that is very odd. I sent a post and it came out first. Then andalone, limbofunk, then yours Zort. Yet when I go to the comment to write this, only andalone's shows as the only comment. Yet I got them all in my in box. Very weird indeed ! I'm a little disgruntled, as I got a not very nice e-mail this morning from Dharma Scientist saying he was blocking me from his Facebook. Black Rock is at home! That poster sure has a lot of nice little details! I bet the person that won the print from the charity donation drawing and hasn't received it in over 3 months is disgruntled. What's the story on the Charlie and Desmond? While I like the scene that's depicted, their expressions come off as almost comical. charter, you don't know what you're talking about. Again. I told Ian/Zort months ago I was having financial issues. Then, the same day that Manda decided to block me from L4L, my partner had a very scary health issue, which is thankfully now resolved. However, that day, it was demanded that if I had such serious financial issues, which I do, that I make time to meet up with someone in NYC who could send the poster, rather than just wait until I had the money to send the poster. Since then, Manda's boyfriend, who does not know me at all, has continued to message me nasty things, including hateful remarks about my partner, who has nothing to do with any of this. Manda said she would unblock me from L4L, which she didn't, and has people sending me nasty FB messages at all hours of the morning. I would be glad to send you $20 for postage. What is your paypal address? Amy, I don't have anyone doing anything. If there is an issue, please contact me directly. I don't have PayPal, as I already said many times. Manda, I have been trying to contact you for a week. You have ignored all my fb messages/requests. I would be glad to mail you a money order for $20 to cover postage and gas to mail it at the nearest USPS. Send me your address to my email connected to this account. I will run out and get a money order right now and be waiting for the address. Or, I will pay and print off a postage sticker and mail it to you. I would be happy to reply to any of your messages, but I have received none. If you are experiencing problems with Facebook, please feel free to email me at captainmando at gmail.com. charter, by the time you do that, I will have the money, which is besides the point. I just don't appreciate what was once a nice community for me turning on me for no fault of my own. Manda, why are you lying? This is just absurd and LostARGs is not the place to deal with it. Zort, I apologize for any disruption this has caused. I'll do what I can to deal with the situation outside of here. It's kinda gloomy and rainy out here in LA, so tacos and burning hot burritos would be perfect for this weather! So, anyone going to Comic Con this year? I'm hoping they might have a panel for the S6 bluray/dvd, and perhaps a preview of the "additional footage" we keep being teased about! send that rain here will ya ? I grew up in So Cal and thought I was dying when I moved the NH and felt the humidity. I would love me some dry heat or rain. Rain sounds the best though. I thought D & C said they would not be there for lost again but maybe they meant just them. mistersh0w...you going to 1988's crazy 4 cult this friday? I'm going to try! I planned on being there by 5pm-ish, but I may have been redirected to a movie night with friends... I really, really, REALLY want that Eric Tan BTTF print!!!! I do to:( I doubt you can get more than one but if you can get two, I would gladly pay you back and line your pockets a bit for some tacos. I wanted to go but damn you work!!! I'll certainly try to get two if I go chaseter. If I manage, it'll have your name on it! Amy. Really? I have only been around these boards for a couple of months, but come on. After all the discussions on these boards the last few weeks about your inability to ship someone a print they won fair and square you think someone is going to *buy* an extra Olly Moss from you? I think it's time to end all the poisonous back and forths and just do the right thing. Be the bigger person if you want to look at it that way. I mean you have to realize that at this point everyone here is looking to you as the nucleus of all this negativity whether you agree with that or not. Several people have offered to give you the money to ship it. Also interesting is someone with such financial woes is buying up $50 prints for themselves and apparently has extras just laying around to sell. Do the right thing. Send the poster. End this now. I have enjoyed the last months on these boards -- I wish I had found them earlier. But let's get them back to being a nice, friendly, courteous environment. @Justin, I'm sorry you think I was being obnoxious by posting that. Obviously, my financial situation has a lot to do with me selling extra prints. As for winning the poster fair and square, yes, I agree, but it was also for charity, and the person in question has not even e-mailed me once in the past three months about it, it has been other people on their behalf, people who have no business asking about it. And I'm very sorry that my financial hardship and my partner's health came before a contest. There's people that say "lovely shirt! but i'm poor :(" for an 11$ buy. Davide, I am not sure what you aren't understanding, hon. I bought the poster months before I was having difficulty. Creating a paypal account is not an option? It's a 5 minute thing. No, I do not have access to PayPal. Speaking of posters we love on the wall- I have hung up Black Rock at work and everyone is very impressed-great work DD. And there was only one other poster that I "need"- so I looked on EBay yesterday and there was the Polar Bear just waiting. My only Ebay purchase ever-for just a bit over the original $50. So we'll see if it shows up now! I really like the bear. @chaseter... I will be going Friday to the gallery and plan on lining up very early! If you need something email me and we can work it out? Though you know I'd rather go to the gallery... Even if it will be infested with thousands of nerds that all want to feel Kevin Smith's breath on their sweaty cheeks! @Mistershow... If you don't go I'll catch some of Kevin Smiths breath and make sure it gets to you!!!! Hey folks that are going to the Crazy 4 Cult show! I'd love to get a copy of that BTTF as well, if anyone can grab an extra. Thanks! Last I heard they both don't have a piece for the show. I think Stout even posted on his blog or his site that he is not. The last 2 prints were impulse buys... so someone who doesn't have can make out like a bandit. Shipping is to USA only. International is an option, but pricing will depend upon destination. Thanks & please let me know if you have any questions at jlahair at yahoo dot com... NAMASTE! Update - Kate & Claire have left the island. Stop ruining this place for the rest of us. Grow up and deal with your issues in a more mature way. Wow, action overnight. I like waking up with something to read. Also, does anyone watch Yo Gabba Gabba? My band did a song for it and I'm pretty proud.. so you should all check it out! 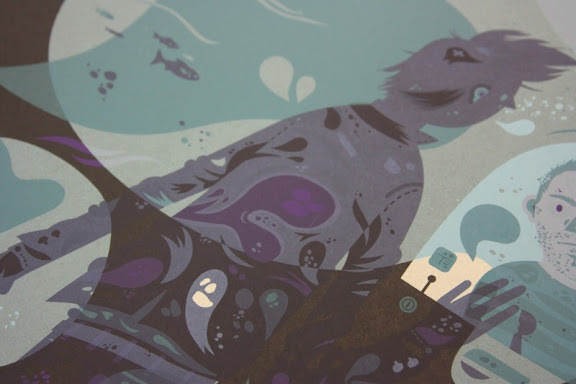 Yesterday the Black Rock came, today's the Olly Moss' Day! 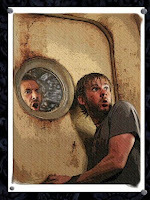 I'm going to SDCC also, but I don't expect any "Lost" programs. The program guide should be up very soon, so we'll see. I'm so in love with the "Iron Giant" poster that's in the C4C show. The Tan isn't all that great to me. Swound, my son loves the show. We've DVR'd them for him and I have most of the episodes memorized. Great song too! I like your bouncy British jingle very much Swound- congrats! We should get a comic con list going! So All the Argers can meet up? ... I'm only going Friday though! wow, awesome. that was really my favorite fake poster! Thorsten. Good to see you. has anyone recieved their joshua poster yet? email me at tmarasco125@gmail.com if you're interested! @ Amy-Lynn, just curious, how much are you offering the Moss print for? ive gotten a tracking number and it doesnt work i also emailed the artist and he said it went out last Wednesday stil nothing. im not upset with the artist just the mail carrier. Congrats to the cast and crew for all the Emmy love for LOST!!! Thanks for posting that, maven. Interesting that Fox is considered a lead and O'Quinn isn't? No offense to Matthew Fox, who was SUPERB this season, but TO'Q sort of carried S6, in my opinion. Good for Emerson, as well. Ooh, and Elizabeth Mitchell. Didn't see her down there. I was very happy to see Lost get several nominations, and was particularly happy for Matthew Fox. Out of interest, I got a shipping confirmation for The Black Rock from postclub USA but the tracking feature doesn't work. As I didn't get one for Olly's poster, just trying to see if this is just some seriously coincidental scam or just a really rubbish website. For those who aren't able to attend G88 tomorrow, the official word is that you'll be able to purchase art from the gallery online Saturday morning on the G88 site. Not sure if there will be anymore BTTF prints left over for the online sale, but it's worth a shot. If I'm able to purchase more than 2 (got chaseter covered for 1 extra if I can manage) then I'll definitely sell for the original asking price... But I'm gonna warn you all now, for what I've seen so far in the previews for tomorrows show, I won't be able to afford any extras!!!! I would be indebted to anyone that can help! I with ya! I'd love one(BTTF) but live on the East Coast. Woah, I missed a lot! Started my new gig in the entertainment industry (MTV Networks, actually) so I've been swamped and forgot to subscribe to the new thread. This print looks pretty sweet, wish I had the wall space for it. Congrats to those who do! Shipping for each poster in the USA is $12 (FedEx 3-Day signature required). International is available, please contact to discuss. 36 days and counting to hit $6,000.00. It can be done! In return for the fun they all gave us in “hunting” for the url that was released on the mural in Buenos Aires, I’d ask that you help fund the project by pledging as little as $5.00. Here’s the deal… if the project is not funded… you will not be charged for your pledge. Each level of pledge comes with some type of reward (autographed books, post cards, t-shirts, prints, and more). I’ve already committed /pledged $500 and hope to contribute more by cashing in some of my unused vacation time as well as selling these prints to help with funding. Out of respect of Zort and the entire LOSTARG’s community, I will not post this info again in this comment section or any other comment section. Additionally, I will not post this information on other sites for another 24 hours to give YOU… my fellow friends a first crack at these prints. Please email me at jlahair at yahoo dot com. P.S. All of these prints and the experiences in obtaining them will always remain near and dear to me. I will also not be selling my 3 favorite prints as I do need to keep my all-time favorites & a piece of this unforgettable experience - The Barracks, Rousseau’s Transmission, & LOST Live-Jack. JPL, very generous of you to be such a big help to DGPH and their latest art project. Good luck! For those who might be interested--Gallery1988 will be putting up what is left of the prints that were released at the opening last night, featuring quite a few familiar DCAAPB artists. Little Friends of Printmaking have done a Pee Wee Herman piece, or you can check out Jeff Boyes' Point Break, Kevin Tong and Todd Slater's Rushmore, Eric Tan's Back to the Future, among others. So keep an eye on their website today. I know that one of the best things for me about the whole LOST print series was the chance to be introduced to some new artists, and here's your chance to pick up some cool stuff from several of them. G1988's stuff is up for sale. Not the prints. All original artwork was for sale last night online when the show went live. The prints will be online some time today. Thanks, charter. I thought those prices looked a bit steep. They said this morning and the gallery opens at 11am PST so that is in 30 minutes if you want to get your f5 key angry at you again. Not shopping for myself, but the Iron Giant print is fantastic. Not sure if this has ever been brought up, but a friend of mine forwarded a VERY interesting blog posting on the ULTIMATE theory on what LOST was and is all about. ABC’s LOST: the ultimate theory and explanation. @chaseter - Hope you were able to bag Tan's BTTF print online! I wasn't able to get an extra at the show due to gorging on prints for myself! I couldn't help it, they were too amazing! Can you blame me!? Damn you DCAAPB for starting this addiction! Just snagged a Barracks print on eBay for $42! What a steal! And a LOST number to boot -- must be a sign. Thanks mistershow but I did not get one. I didn't want to buy one online without knowing if you or wein got one, which would cause you to have extra. JPL, that was one of the best theories I've read so far. The only thing that bugged me was it puts a lot of reliance that Darlton knew early on how it was going to go. I thought nothing specific was truly nailed down until they made the decision to end the show after season 3. Still, all of the themes of the show (redemption for past sins, letting go, etc.) are in S1-3, they're just explicit in S4-6 as to how they contribute to the overall tapestry of the story. I'm glad people are still investing in the show and trying to make sense of it. 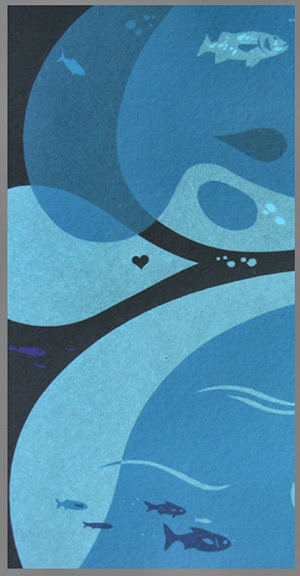 DCaaPB Series II artists are now starting to sell APs at their sites. Money direct to artist. So, please share with friends. 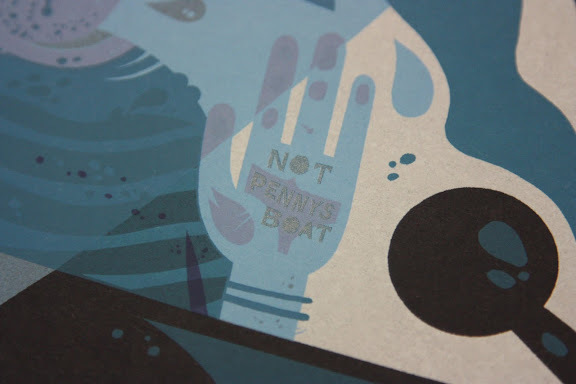 http://www.visualtechnicians.com/prints.php - for Jeff Boyes "Desmond"
and Little Friends of Printmaking for "Not Penny's Boat"
Any Uk'ers still having delivery problems? I still have 5 of my 7 orders undelivered. I have tried phoning GoMerch 3 times yesterday and all I got was the answerphone, even at 10am their time. I emailed them and have received no response (even after the 8 week deadline). And postclubusa are sending me duff information about shipping numbers. This is on the back of the highest shipping costs I have ever had to pay from the USA. Is anyone else finding this GoMerch a complete rip off? Are ABC behind the sale. I might have to go to them? Yep.. same old. 4 out for delivery.. Postclub tracking doesn't work on two of the items.. On the others I get some cryptic message about the item being 'pre-advised'. It is really stupid, isn't it? But then I'm happy to say that til I'm blue in the face.. 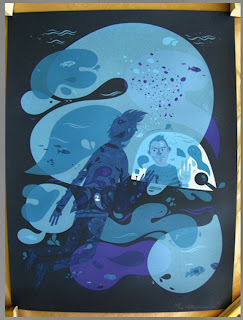 I've had my Black Rock print and one of my Olly Moss prints now. No sign of the second Olly Moss though. According to the tracking, I've had my Olly delivered.....5 times, on three different days, even though I only ordered one. Still waiting. I'm even outstanding a tee shirt ordered in week one. They say it was delivered and left in my designated safe place. The Garage, at my house in Germany. I have three problems with that. Firstly, I didn't designate a safe place. Secondly, I don't have a garage. thirdly, I live in England!! Yes that's my slight concern ioloos, that three posters were sent but only two arrived. I don't have tracking numbers yet, but at least someone was here yesterday when they arrived so I definitely know only two tubes were delivered. Outsourcing to someone else is great when you don't have time to do the work, but when it starts making you look incompetent then it is a very bad idea ! ioioos- looks like you are going to have to make a trip to Germany to pick yours up! Funny- I just signed up for Ebay and have started to get Ebay emails in German from "Kundenservice" asking me if I will take a survey. Conspiracy? Seriously though- that's bad that you can't get your orders- maybe all the UKer's should start leaving messages on Go Merch's Twitter & Facebook accounts and they may get the hint. Mine are getting delivered to my old address (it took THAT long for them to ship!) So I'm hoping they have turned up next time I go round.. By the way, my old address is my parents house. My Olly showed up yesterday and it was not what I was used to seeing, tube wise. Firstly, no customs forms. Only a address label printed by Royal Mail, which is strange. Secondly, as ioioos said, mine said leave in designated safe place, GARAGE. Luckily my dad was off yesterday and accepted the tube for me. Finally, the tracking that I received for the black rock appears to be tracking my olly poster, not my black rock. Got an email back from go merch saying that postclub is to do with them yesterday, which is when olly arrived. I dunno, the whole process seems a little bit longer than necessary. well happy Birthday Chris !!! hope it's fantastic !! very cool Chris !! Love it !! Happy Birthday, Chris! Awesome Locke! How tall is he...Hard to tell. Maven, just a little shy of a foot tall! ChrisL - Hope you're having lots of Dharma Delights on this special day... HAPPY BIRTHDAY! AWESOME! ChrisL just tweeted that his wife is thinking about making a limited run of 10 of the knitted John Locke!!! I soooo want one! ChrisL: Put me down for a John Locke knitted masterpiece!!! Maven, thank you. That's fantastic. The interest from you guys and on Twitter made me able to convince her he's a cutie! They take around 4 - 5 hours each so I figure @ $45 including postage to the US from the UK should make it a happy thing all around. Expecting a couple of weeks to get to you if that's OK. Thanks again... so much. I'm insisting she only does 10 though in keeping with our tradition of limited editions :-) 5 have gone this morning so if anyone else wants to nab one please say so soonest. I want a Hurley now! @JPL, thanks for the wishes! Had a great day. Family clubbed together to pay for some framing so Sun and Jin, Fenway and Black Rock can go up soon. Hooray! I got my Olly Moss print today. It was rolled ridiculously tight. It was also left outside in the thunderstorms under the porch of our summerhouse. Luckily the print wasn't affected in any way.. I don't really understand how though with how wet it's been! Also, I noticed on the shipping note it says that my 'Safeplace' is in the garage if nobody's at home. I never gave that info to anyone! New Entertainment Weekly has a picture from the Ben and Hurley sequence from the upcoming DVD of Season 6. I think I'm giving up on GoMerch. I have emailed them again, nine weeks after I placed my orders and they still didn't respond. I have phoned them, and they are very apologetic, telling me they will find out where my items are and email me back and I never hear from them. For three days I have asked for correct shipping numbers and each time they never phone back. they tell me they are having problems getting the information from their shipping partner. Can someone advise me what the law is in California for cancelling an order that is taking beyond the quoted shipping dates? My Kate and Claire print got posted two weeks before my Moss one.. yet I've seen no sign of it.. I emailed GoMerch a couple of days ago about my final poster and they have now emailed back to say that it has just arrived in the country. We shall see if it arrives soon. The safeplace info is very naughty of GoMerch if they didn't ask for the information.